On the night of 23 September 1916 12 Zeppelins crossed the Channel to attack locations around the country. Two of them were to make their final resting places in the fields of Essex, much to the surprise of the locals who found these giant machines descending upon them. One of the giant airships, the L33, made a forced landing at Little Wigborough and the crew all walked away largely unharmed. The other, the L32, crashed in flames in Great Burstead, killing all on board. There are many records in our collections which tell the stories of both of the airships coming down, from civilians, Special Constables, Police and the military. Why were there Zeppelins over Essex? Zeppelins were giant airships used by the Germans to drop bombs on Britain during the First World War. They were named after the German Count Ferdinand von Zeppelin, who pioneered them from 1895. They were filled with hydrogen which is lighter than air, but explosive. They were 650ft long and carried a crew of 22 and a payload of 2 tons of bombs. Airships flew over Essex attempting to reach London. They crossed the North Sea and flew over the Essex coast, before following the Great Eastern Railway or the River Thames to London. Many never reached their destination because of anti-aircraft guns around the capital, and turned back, dropping their bombs indiscriminately over Essex. On the night of 23 September 1916 Zeppelin L33 was busy dropping incendiary bombs over Upminster and Bromley-by-Bow when it was hit by an anti-aircraft shell, despite being at an altitude of 4,000m. Its gas bags were punctured by shrapnel and it started to lose height. By following the railway line, the crew navigated to Chelmsford where they were engaged by Lieut. A de B Brandon of the Royal Flying Corps, but his machine gun fire had no effect. The ship was losing height and the crew jettisoned everything they could; items were found strewn across the fields over the next few days, including a machine gun, two cases of machine gun cartridges, and maps. By 1.15 a.m. the ship had reached the coast, but the crew realised they could not make it back across the Channel. The Commander, Kapitanleutenant Bocker, turned the ship inland and brought it down near Little Wigborough, narrowly missing some cottages. Bocker spoke good English, and he warned the residents of the nearby cottages that the airmen were going to set fire to the airship to prevent it falling into British hands. The Zeppelin was burnt and left as a broken shell, but there was still much in the wreckage that the British could learn from in building their own airships. The crew then set off to walk to Colchester to give themselves up. They were found on the road by a Special Constable and remained in captivity for the rest of the war. The Zep. is a vast monster, lying in its naked framework of girders, across 2 fields & a land between them. Parts of it look absolutely unhurt, but of course the gas bag is all burnt and the bottom machinery part is all smashed on the ground, & its back is broken & bent in several places, so that it looks like a gigantic antediluvian reptile of sorts, with its nose posed in the air, & its tail intact behind. I tried to make a very rough sketch of its shape as it looked from the stubblefield, which was the nearest we were allowed to go, about a field off. Her writing is a little tricky to read in places, but still the letter gives us a sense of the sensation the Zeppelin created in the village and surrounding areas; you can read a transcript of her whole letter here. There are several documents written by Police and Special Constables which tell us about what happened on the night of 23 September and in the following days and weeks. This letter from Captain M Ffinch reports on how the Special Constables of Peldon helped to control the traffic and sightseers which descended on the village on day after the Zeppelin landed. It also includes a report from Special Constable Edgar Nicholas, who was the first local man to encounter the German crew. Nicholas described being in bed and hearing an explosion at about 1.20am. He got up and set off on his bicycle towards Little Wigborough, where he could see a fire. Before he reached the site of the wreck he came across the German crew who were trying to find their way to Colchester to hand themselves in. Nicholas followed them to Peldon village, talking to those in the crew who spoke English. One of the Germans asked him what English people thought about the war, and shook Nicholas’s hand. The party soon encountered other Special Constables and the crew was handed over to PC Charles Smith at Peldon, who telephoned the army to come and fetch the crew to take them prisoner. While the L33 was making its forced landing in Little Wigborough, the L32 had bigger problems. It had dropped its bombs in Kent before flying north over Essex. It was spotted by a BE2c flown by 2nd Lieut. Frederick Sowrey, who hit the airship with incendiary bullets which set it alight. The L32 came down in flames near Great Burstead. The entire crew of 22 men was killed. The next morning, some of the girls who lived that way went to view the wreck. They also saw some of the poor lads who had been shot down; they only looked about 16 years. We could not help but feel for their mothers in Germany. Well, yesterday morning at 7a.m. we were sitting at breakfast when the adjutant came in and told us to be ready as soon as possible full marching orders – that is horses and men with everything on. The first twenty who were ready were sent off with Lieut. Young (I was one of them) to where the wrecked Zepp was. We had ten miles to go and we travelled hard. There was a mark along the road of the sweat off the horses. We trotted every step of that ten miles. We picketed our horses, left three men to guard them, and fixed bayonets and down about 20 yds to where the heap of wreckage was lying. We had to keep the people back form it. Everybody wanted a souvenir & most of them got it too. There must have been an explosion after she landed for there were bits found a mile away. The heap of twisted bars of alliminimum [sic] was about 40 ft high. A tremendous pile, unless you saw it you would hardly credit it. Then the work of pulling out the bodies commenced. It was a gruesome job. The R.A.M.C. and the R Flying Corps did that. They got twenty two bodies. The commander was not badly smashed but some of the others were in an awful mess. The crewmen were buried in Great Burstead churchyard. Their bodies were later moved to Cannock Chase. A dazzling day & a very happy heterogeneous crowd of country people, mixed with Colchester of course, all taking their Sunday matins in that pleasant form. A good many soldiers and officers of course from Colchester, with their womenfolk & I saw one old General & lots of red tabs prancing [?] about on the stubble with the common herd. It was Fred & I who swelled the godless crowd. I persuaded him to come with my in the morning. Daisy & Nettie have gone this afternoon, but I expect the few hundreds will have swelled to thousands this afternoon. It was such a jolly local crowd, gazing at their own Zeppelin, none of y[ou]r hoards from London. The crowds were immense during the day but very orderly, altho’ quite annoyed at not getting closer. During the day there were six British aeroplanes and a British airship came along to see the wreckage. One of the aeroplanes landed not twenty yards from where I was standing. Capt. M Ffinch sent the Special Constables of Peldon out ‘to assist in the control of the enormous traffic caused by the thousands of sightseers in all kinds of conveyances’. Many of these sightseers wanted a little piece of Zeppelin of their own as a souvenir of their unusual experience, which caused an even greater problem for those tasked with guarding the wrecks. The wrecks were considered to be of military importance, and punishments for anyone found with anything taken from the wreck sites were severe – a fine of £100 or imprisonment with hard labour for six months. Our Policemen got near & picked up a bit of the burnt gas bag covering and gave it to George whom I met on the field & he gave a bit to me. It is very fine canvas with a silky sheen on it. I got a lot of wee bits of Zepp but we were not supposed to take them away altho’ there wasn’t a man there who hadn’t a bit. This is a piece of it I picked up near it. The cloth is a piece of the commanders [sic] clothing. Even though this is one of our longer blog posts there is still plenty of material in the archive which we have not had space to mention. 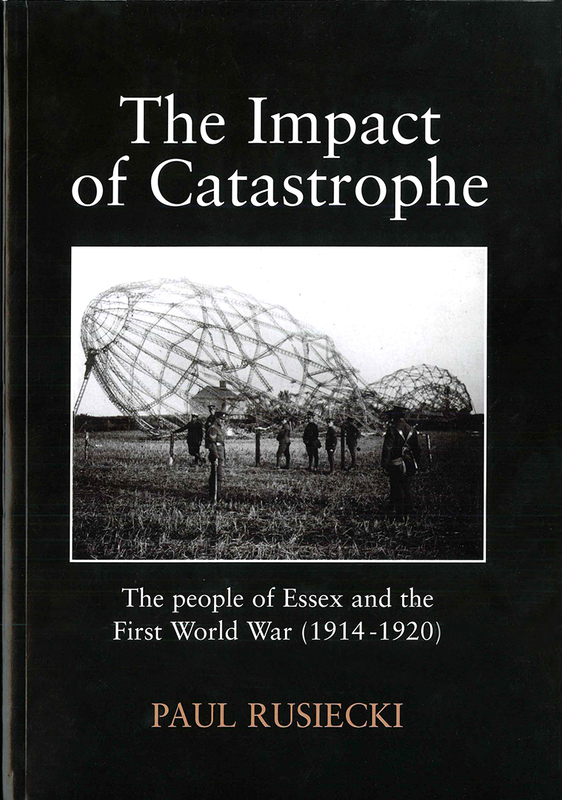 If you would like to know more, we recommend The Impact of Catastrophe by Paul Rusiecki which is available to read or buy at ERO (£17 + P&P – call us on 033301 32500) or to borrow from Essex Libraries. If you would like to go straight to the primary sources themselves, why not have a search on Essex Archives Online to discover what other stories our archives hold. On Saturday 24 and Sunday 25 2016 the village of Little Wigborough is holding Zepfest to mark the centenary of the landing of L33 in their parish. There will be a small display from ERO in St Nicholas’s church, and there are activities taking place all weekend. Following our recent post on what a manor was, Archivist Katharine Schofield takes a more detailed look at manorial court rolls. You can find out more about manorial records and how you can use them in your own research at Essex through the ages: tracing the past using manorial records on Saturday 12 July 2014. The majority of manorial records in the Essex Record Office are the records of the manorial courts, which are among the most important sources for medieval social and economic history. Their greatest importance is in recording the lives of the ‘ordinary people’ of the county; in the years before parish registers began to be kept in 1538, these might be the only records in which a relatively ordinary person might appear. 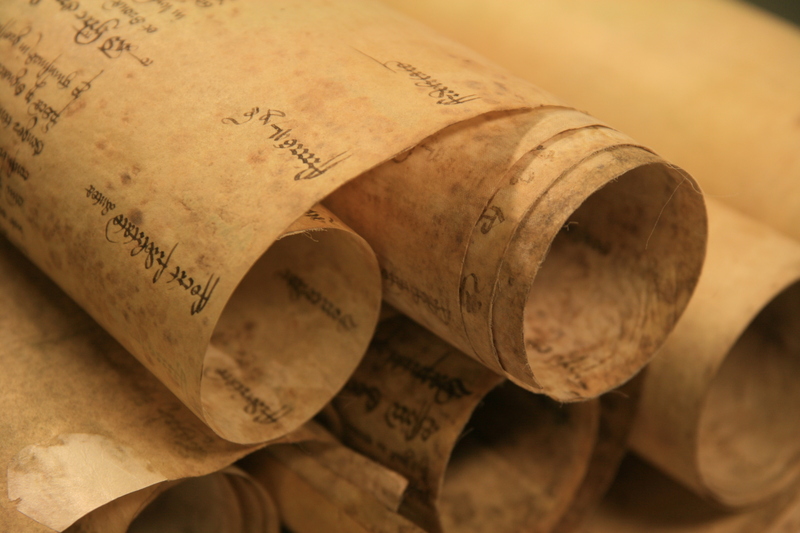 Some of the Essex manorial rolls also contain evidence of events of national significance, such as the Black Death of 1348-1349 and the Peasants’ Revolt of 1381. The manor courts dealt with everything from maintaining hedges and ditches to keeping the peace when disagreements (and sometimes violence) broke out amongst the manor’s tenants. The court was presided over by the lord of the manor, or more usually by his steward. The records were kept in Latin until 1733, but if you don’t read Latin don’t let that put you off; the later material is in English and these records are stuffed full with fascinating details of daily life in the past. There were two types of manorial court, the court baron and the court leet, although the earlier rolls do not distinguish between the two. Broadly speaking, the court baron dealt with matters pertaining to the administration of the manor, and the court leet handled minor criminal offences. The court baron handled the administration of the manor, including customs (such as the use of common land for pasture, and maintaining buildings, paths and hedges), settling disputes between tenants, enforcing the rights of the lord and any infringements, and on occasion requiring the lord to fulfil his obligations towards the tenants. The court rolls record fines levied on tenants for breaking the rules of the manor, such as trespass against the rights of the lord or other tenants, or failing to keep roads, paths and ditches clear. In Writtle in 1452 for example, seven animals of John Croucheman strayed on to the land of another tenant and ate two haycocks (a small cone-shaped pile of hay left in the field until dry enough to carry to the rick or barn), and in 1477 two tenants of the manor of Great Burstead were fined for leaving dung in the main street of Billericay in front of the chapel. There were also cases where tenants were bound to keep the peace towards each other and occasions where women were presented as a ‘common scold’. At High Roding in 1525 Agnes Norwood was presented as a scold and disturber of the peace and no tenant was to allow her to live in their house on pain of a fine of 3s.4d (D/DU 886/3). Extract from court roll of High Roding, 1525 (D/DU 886/3), in which Agnes Norwood (you can read her name in the third and fourth words on the first full line shown) was denounced as a scold and disturber of the peace. She had been living in the house of John Baker – you can make out his name in the third full line shown. The rolls also record the customary fines tenants owed. These included ‘chevage’, the right to live outside the manor. In 1356, for example, a tenant of the manor of Bulphan paid 6d. for a licence. The court baron was also responsible for the appointment of various officers, including the reeve who would collect rents and ensure that the tenants fulfilled their obligations, and the haywards and woodwards who were responsible for the maintenance of hedges, fences and woods. By the 16th century this business had become much less important. The deaths of tenants and admissions of new tenants to land were also recorded by the court baron. The lord was entitled to the payment of a ‘heriot’ (usually the best beast) on the death of a tenant and an entry fine by the incoming tenant. Tenants of manors were described as ‘copyholders’ as they held land by copy of the court roll. Copyhold land could be bought and sold and left by will and many hundreds of copyhold deeds survive in the Essex Record Office. From the 16th to the 20th century most of the business of manorial courts related to the recording of admissions and surrenders of copyhold land. With the decline and eventual cessation of this type of landholding in 1922, the business of the courts baron ceased. The court leet was the lowest court of law enforcement and dealt with minor offences, such as nuisances, affray or assault, selling faulty goods, using false weights and measures, playing unlawful games, keeping disorderly alehouses, disturbing the peace and keeping inmates and vagabonds. The court was also responsible for the election of the constable. The court leet was also where the lord of a manor would hold something called ‘the view of frankpledge’. Many, but not all, manorial lords had the right to do this. This was a practice with Anglo-Saxon origins. All able-bodied men in a manor were grouped in tithings (roughly 10 men). All the men of the tithing were bound in mutual assurance to observe and uphold the law – if a member of a tithing broke the law then the rest were obliged to report the crime and deliver the culprit to the constable. Failure to do this would result in everybody in the tithing being fined. If the lord of the manor had the right to hold the view of frankpledge then the chief man of each tithing (called variously tithing men, headboroughs, decenners or capital pledges) would report to the court leet to represent his tithing. Tenants could also be fined by the court for failing to obey the law. Offences included keeping unlicensed alehouses, not practising archery (all men were required by law to practise their archery so their skills could be drawn upon in times of war), and playing unlawful games; in 1564 and 1565 14 men in Ingatestone were each fined 4d. or 8d. for bowling. There were also more serious crimes, including cases of assault. In 1467 Thomas Hurst of West Hanningfield was fined for breaking into his neighbour’s house by force, taking his goods and claiming him to be outlaw. In 1472 in Earls Colne a mob of gathered with bows, arrows, pitchforks and other weapons and broke into the houses of three tenants, dragging one out in his shirt, and beating them severely. You can read a full translation of the passage here. Extract from D/DPr 69, a court roll from Earls Colne, which describes a serious assault. The court seems to have given up trying to translate ‘pitchforks’ into Latin, and written it as ‘pycheforkes’ (underlined in red). During the 16th century most of the legal cases were being dealt with by Quarter Sessions and by the 17th century the court leet had no significance and rarely, if ever, met.